A revolutionary technique developed by an astrophysicist at Rochester Institute of Technology could allow for a better understanding of the fates of solar systems when their stars cease to shine. Jason Nordhaus, a National Technical Institute for the Deaf assistant professor of physics and a program faculty member in RIT's astrophysical sciences and technology Ph.D. program, has developed a system of complex 3-D super-computer algorithms able to pinpoint the existence of previously undiscovered planets and celestial bodies associated with dying stars. His research is partially funded by a three-year grant from the NASA/Space Telescope Science Institute. "The deaths of ordinary stars are marked by extraordinary transitions," explains Nordhaus. 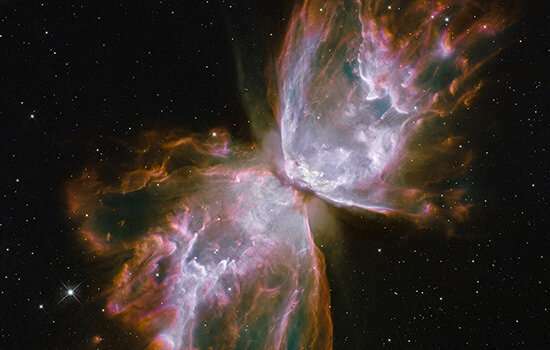 "Iconic high-resolution images of dying stars have transformed our understanding of these events. In the past decade, we have discovered that this process of death that produces these spectacular images is linked to the presence of another star or planet in the system. However, large amounts of dust that mask these companions make them difficult to directly detect. We will continue to uncover the nature of these hidden companions and pin down where they orbit in these systems." Nordhaus' technique was previously used to infer the presence of a hidden planet in the dying star L2 Puppis, which was later detected by the Atacama Large Millimeter Array, a collection of radio telescopes in northern Chile that observe electromagnetic radiation. This summer, Nordhaus will work with several deaf, hard-of-hearing and hearing students at RIT's National Technical Institute for the Deaf to study four systems for which Nordhaus has comprehensive data obtained over the past two decades. They are hoping that their 3-D computer simulations will help determine which planets survive the death of their parent stars and which are ultimately destroyed. "This helps us understand the fate of our own solar system, the fates of other star systems in the galaxy, and improve our understanding of how stars and planets interact," said Nordhaus. In addition to performing this groundbreaking research, Nordhaus is a member of RIT's Center for Computational Relativity and Gravitation, whose simulations of merging black hole binaries were used by the LIGO Project to confirm the breakthrough detection of gravitational waves from binary black holes in space.